"How do you know it's a Parasitic Jaeger?" The title of today's blog was far and away the commonest question that I heard asked at Cape May Point today; the reason being that a Parasitic Jaeger decided to completely ignore all the text books and do what no self-respecting Parasitic Jaeger would normally do, and that is, put in a land-based appearance on the East Coast of the USA. Despite being the commonest of the three jaeger species in South Jersey, experiences with this species usually involve distant views of birds chasing terns and gulls, well offshore in The Rips. Tom Reed was surprised to get a few shots of this bird as it passed all too quickly over the Hawkwatch Platform on Saturday, but it was an even greater surprise to all present when the bird reappeared today and parked itself on Bunker Pond. After 20 minutes or so, it lifted off and flew over to the beach, remaining on the sand just west of the bunker for well over an hour. Eventually the jaeger took off and flew around for several minutes before settling on Lake Lily. After departing the lake, it was not reported again today, but may reappear tomorrow. So, how do we know it's a Parasitic Jaeger? Jaegers are notoriously difficult to identify to species, mainly because there is a certain amount of overlap in size between the species, and because there is much variation in plumage at all ages. We can start by ageing the bird which in this case is, fortunately, very easy. The whole plumage shows more or less equal amounts of wear with no signs of there being feathers of different ages present. In addition, there is no sign of a dark cap. These two facts add up to the bird being a juvenile. With this in mind, there is now a quick and easy way to identify the species - juvenile Parasitics are the only Jaegers to show crisp, well-marked pale tips to the primaries. A bird actively feeding a mile offshore would be much harder and identification would rest on more subtle differences in body and wing structure, and the amount of white in the primaries. A Parasitic Jaeger resting on a New Jersey beach is not really an indication of a healthy bird and there is a fair chance that this bird is not well. With no obvious outward sign of injury it is difficult to know what is wrong but maybe it will recover and carry on south for the winter. Here's a few annotated pictures of today's star visitor to Cape May Point. Parasitic Jaeger is 'Mr Average' when it comes to jaegers - larger than a Long-tailed but smaller than a Pomarine, and with an 'average'-sized bill. Overall, this is a typical intermediate morph bird with chocolate brown upperparts and well barred underparts. Note the obvious pale tips to the primary flight feathers [photo by Mike Crewe]. When preening, our bird conveniently gave us a good look at its tail feathers. Notice that the two central feathers are a little longer than the rest of the tail and have sharply pointed tips [photo by Mike Crewe]. In flight, more of the underparts are visible and the bird appears overall much paler. Note the extensive amount of white in the base of the primaries [photo by Mike Crewe]. Perhaps the biggest indication that our bird is not 100% fit came when the local Fish Crows dropped in to investigate it. Crows have an uncanny knack for spotting anything living that is not entirely fit and will sometimes relentlessly harass injured or dying creatures. Here, one of the two crows on the left has hold of a primary and is giving it a good tug. Happily, our jaeger came out of this experience unscathed [photo by Mike Crewe]. Just a quick forward warning to anyone currently birding in Cape May, or planning to do so over the coming week. The ongoing program of spraying Common Reed at The Nature Conservancy's South Cape May Meadows continues this coming week; initially, plans were for work to take place on Monday and Tuesday but it now looks as though it will take place later in the week. Whatever happens, the reserve will remain open during the work, though there may be some temporary closure of part of the trail. Large scale spraying of the big stands of Common Reed that had invaded the site was completed a couple of years ago and current work involves more localized and targeted applications. Hopefully this work will not impact too much on migratory birds using the site. Over the past couple of weeks, Soras have been fairly easy to find in the evenings as they come out to feed along the margins of the taller stands of vegetation. These secretive birds can be looked for from either of the two trails - try looking a half hour before sunset, stand quietly and scan the bases of the emergent wetland plants along the edges of the open mud and water. A few Pectoral, Stilt, Least and Semipalmated Sandpipers, Semipalmated Plovers and Lesser & Greater Yellowlegs are still around at both the meadows and the state park, while an American Avocet spent most of Friday (27th) on Bunker Pond at the state park. 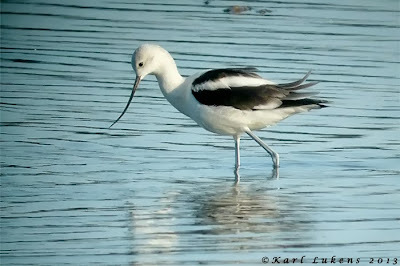 Shorebirds are still filtering through Cape May Point in small numbers. Bunker Pond offers some great opportunities for close up shots of shorebirds, such as this Greater Yellowlegs. Our Photo Walks on Tuesdays with Scott Whittle, or on Saturdays with Mike Hannisian, provide the perfect way for you to get out your cameras and start grabbing some great photos - check out the Kestrel Express (available from the Northwood Center) or our Online Calendar for more details [photo by Mike Crewe]. Soras are easily spooked by noise and sudden movement, but calm patience can be rewarded at The Meadows with good views, especially in the final hour of daylight before sunset. This bird was showing well on Thursday [photo by Mike Crewe]. The concrete ship off Sunset Beach is often an interesting place to check for birds. Just prior to this photograph, the Great Blue Heron on the left had us completely bemused when we spotted it swimming in the water, some 40 yards south of the ship. One can only speculate why it was doing this but it's possible it was a tired migrant that came back in off the bay and almost didn't make it to safety [photo by Mike Crewe]. Though this post is largely about wetland birds, never forget to check for warblers around Higbee Beach or Cape May Point at this time of year. This Magnolia Warbler was searching for insects in a hackberry right outside my office window [photo by Mike Crewe]. The period began with warm conditions ahead of a strong cold front that arrived during the overnight hours 21-22 Sep. Decent hawk and songbird movements took place after the passage of the front, and NW/N winds persisted through 24 Sep. High pressure dominated Cape May's weather through the rest of the period, with winds increasing from NE/E through 27 Sep. Notable birds during the period included Eurasian Wigeon and American Avocet. The season's first small flight of Canada Geese occurred over Cape Island 23 Sep. A male Eurasian Wigeon appeared on Bunker Pond, CMPSP 23 Sep and lingered through 27 Sep (TM, m. ob.). An early southbound White-winged Scoter was tallied at ASW 25 Sep (TM), while 44 Brown Pelicans were counted there 25 Sep (TM). Double-crested Cormorant migration is now in full swing, with approximately 7,500 tallied at ASW 25-27 Sep (CB, TM). A nice total of eight Great Cormorants was notched at ASW 24 Sep (CB). At least one American Bittern was observed throughout the week at CMPSP (m. ob.). A single Cattle Egret was observed in Goshen 27 Sep (JS). 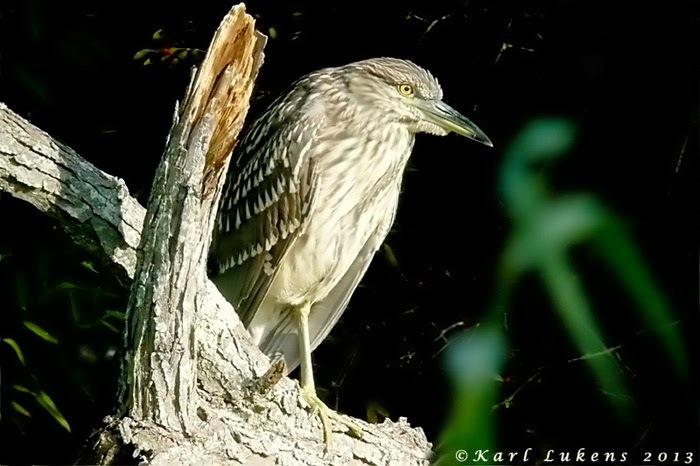 Small movements of Great Blue Herons and Black-crowned Night-Herons have occurred during recent nights with E winds. Hawk flights were again light, with the exception of 1,414 birds counted at CMHW 22 Sep (TR). Selected daily maxima for the period included 531 Sharp-shinned Hawks, 127 Cooper's Hawks, 485 American Kestrels, and 107 Merlins on 22 Sep, along with 163 Ospreys and 86 Peregrine Falcons on 25 Sep (TR). Multiple Soras continued to show sporadically at SCMM through the week. An American Golden-Plover flew past CMHW 21 Sep (RC et al. ), and the same or another was present at SCMM 21-22 Sep (RH, KH, m. ob.). Thirteen Whimbrel and two Marbled Godwits were observed in the back bays from The Osprey tour boat 25 Sep (m. ob.). 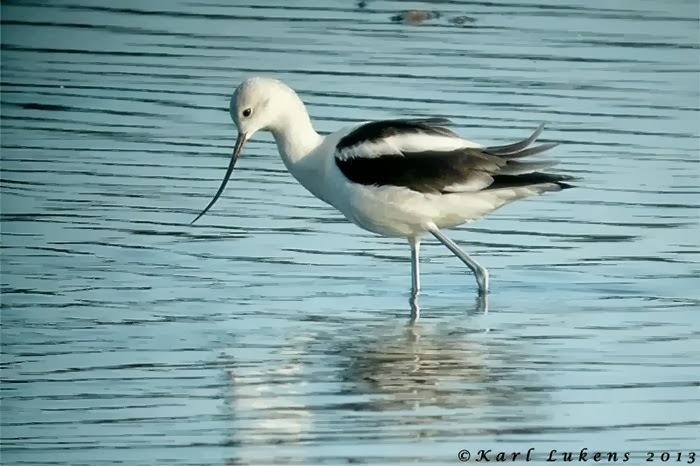 An American Avocet spent most of 27 Sep at Bunker Pond, CMPSP (TR, m. ob.). Eight Stilt Sandpipers were also present there 27 Sep (TR). At least seven Parasitic Jaegers have been seen in "the rips" off Cape May Point this week (RC, m. ob.). Two or three Eurasian Collared-Doves remain at Cape May Point. Common Nighthawks continue to be seen during some evenings, most often hunting between SCMM and CMPSP. A Chuck-will's-widow flew in from the ocean at CMPSP 25 Sep (TR). Small numbers of migrating Red-bellied Woodpeckers have been seen from CMHW recently, and a Red-headed Woodpecker flew past CMHW 23 Sep (TR). Red-breasted Nuthatch, a species that is scarce this season, was seen from CMHW 25 Sep (TR). Nocturnal movements of thrushes were noticeable on a few nights, with a decent number of Gray-cheeked Thrushes over Cape May City 23-24 Sep (MO'b, TR). The season's first American Pipit was noticed at the Higbee Dike 25 Sep (SG). Numbers of Cedar Waxwings are rising; 391 were counted at the Higbee Dike 23 Sep (SG). The Higbee Dike saw a number of quiet days, though a nice flight on 22 Sep included 1,077 birds including 27 Cape May Warblers and six Tennessee Warblers (SG). Species highlights from the Dike included Bay-breasted Warblers 22 and 23 Sep, Hooded Warbler 25 Sep, and Connecticut Warbler on multiple dates (SG). Fair numbers of warblers were found in residential Cape May Point, with the east side of Lily Lake being the best area in recent days. A Mourning Warbler was found at the Two Mile Beach tract of Cape May NWR 25 Sep (VE). Clay-colored and Lincoln's Sparrows were found at the Dike 25 Sep (SG). Clay-colored Sparrow was also found at CMPSP and at Field #5 at Higbee Beach WMA during the week. Observers/contributors: Calvin Brennan, Mike Crewe, Richard Crossley, Vince Elia, Sam Galick, Kathy Horn, Roger Horn, Tom Magarian, Michael O'Brien, Tom Reed. With the marvel of another fall migration at Cape May now well under way, the bird stories are coming in thick and fast. 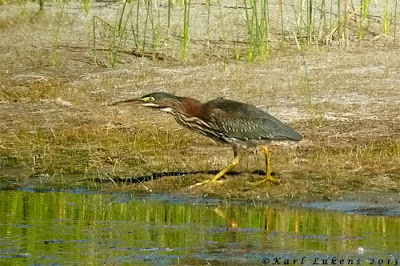 Perhaps the most popular bird of the past few days has been the American Bittern that has been steadily demolishing the frog population on Bunker Pond at Cape May Point State Park. What has made this bird an exceptional experience for its admirers is the fact that it has spent a great deal of each day feeding right out in the open - often in full view of admirers on the Hawkwatch Platform. Bitterns can often be notoriously difficult to see as they spend the majority of their lives feeding within dense, marshland vegetation, so this has been a wonderful opportunity to get to see a bird that is not uncommon but is rarely encountered by most people. Since there are other herons passing through on migration right now which could be confused with American Bittern, here are some pictures taken around Cape May in just the last few days and which highlight the differences between the species. Juvenile Black-crowned Night Heron at The Beanery on our Saturday morning walk. In this species, note the overall paleness to the underparts, the regular lines of narrow streaks across the whole head, neck and underparts, and the relatively large, pale spots on the wing coverts [photo by Karl Lukens]. Our friendly, neighborhood American Bittern on Bunker Pond. 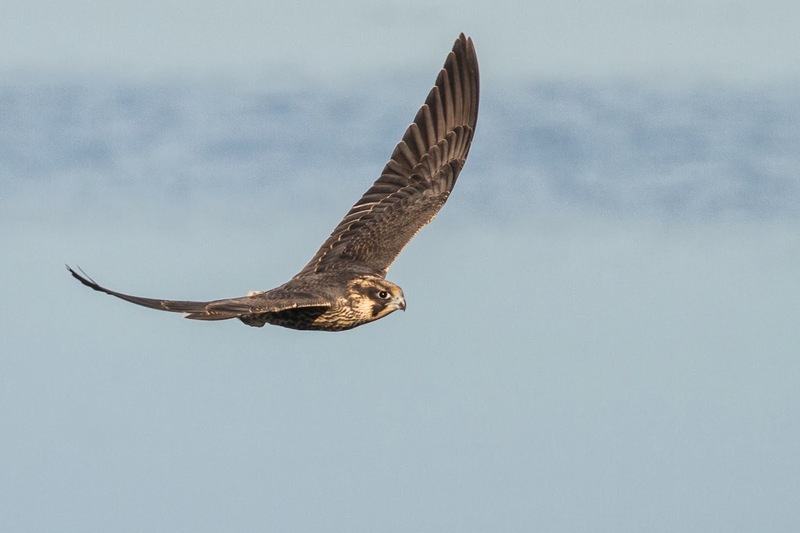 Note the broad, warm brown streaks on the lower neck, the lack of spots on the wing coverts and the clean, white throat [photo by Mike Crewe]. Other migration spectacles around Cape May at present have been captured by an array of photographers, snapping away at anything that moves it seems! Here's a few that I received recently. 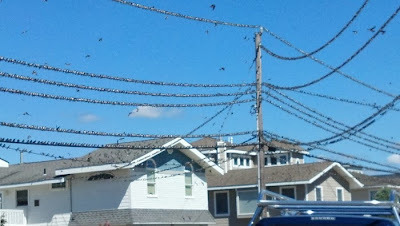 Tree Swallows always create spectacular shows when they gather in great numbers around Cape May. Tree Swallows are around our area for several months during the fall and, during this time, they gather to feed on the ripening berries of the bayberry bushes along the coastal dune habitats. Traditional areas to see these gatherings are at Avalon, the Two-Mile Beach reserve just south of Wildwood Crest and South Cape May Beach. The flock in the picture above was photographed recently in Avalon [photo by Ralph Johnson]. Flocks of trilling Cedar Waxwings, buffetting around on a blustery day in late September are always a delight to watch. 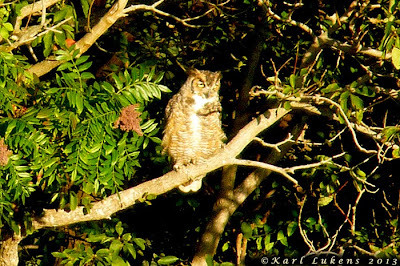 Look for them during early morning flights of birds at Higbee Beach or around Cape May Point [photo by Mike Crewe]. The second half of September usually marks the start of the main Northern Flicker migration through our area. Though numbers of birds are much lower than they once were, parties of up to 100 birds can still be seen, especially at Higbee Beach during early morning flights. Seeing flickers in flight is the best way to enjoy their amazing golden wings [photo by Mike Crewe]. Anyone walking around Cape May looking for birds over the past couple of weeks surely can't fail to have noticed the huge flights of dragonflies that we have been witnessing this year. Numbers and species make-up have varied, but Black Saddlebags, Swamp Darner and Green Darner have made up the bulk of the southbound migrants. 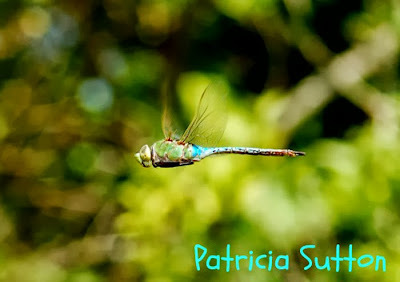 Pat Sutton captured a great image of this Green Darner on one of the recent big dragonfly days. Shorebird migration is now past its peak for this year, but there are still good birds to be found if you know where to look. This Pectoral Sandpiper showed well to the whole group on one of our recent Meadows walks on Monday morning [photo by Karl Lukens]. Ever tried one of our evening walks at The Meadows? If not, you may be missing seeing this fabulous Great Horned Owl that has been posing in trees overlooking the site in the evenings (photo by Karl Lukens). Though typically a bird of much further west than New Jersey, Clay-colored Sparrows are now expected in small numbers at Cape May in fall. Look for them in open, grassy areas, usually with a few bushes to hide in if danger threatens. Cox Hall Creek WMA, the dunes and beach cross-overs around Cape May Point and the fields at Higbee Beach are all traditional places to find them. Look for an overall rather small and pale sparrow with a finely streaked crown, well-marked face pattern, brown rump and contrasting gray nape patch [photo by Mike Crewe]. Despite the frustrations of yet another promised cold front that turned into something of a disappointment, today was a pretty magical day for birds around Cape May. If you were out there today, I'm prepared to bet that you had a pretty good day looking at birds. And yes, this is what Cape May is like when a cold front turns into a let-down!! Higbee Dike bustled with both birds and birdwatchers this morning (one of those days when you test yourself on your knowledge of European accents!) and, though the warbler flight was not big, there was certainly plenty to keep everyone happy. In particular, Cape May Warblers were easy to come by, while Blackpoll and Palm Warbler numbers seemed to be up and a scattering of Yellow-rumped Warblers reminded us that October creeps ever nearer. In the fields at Higbee Beach, Brown Thrashers were noticeable by their presence and, as with the dike, warblers were well represented. The Hawkwatch Platform had its share of fun with a good run of Sharp-shinned Hawks and American Kestrels, as well as a fly-through American Bittern that dropped into the back of Bunker Pond. Yesterday evening's American Golden Plover was reported this morning at least at The Meadows, while the day ended for some with a continuation of the recent run of Common Nighthawk shows at the The Meadows/State Park. I'll keep the wordage short by ending now and simply sum the day up in a series of pictures, all taken around Cape May Point today - see you out there tomorrow! Large flights of Northern Flickers seem to be a thing of the past, but the dazzling spectacle of golden wings in the warm glow of early morning sun is still a classic feature of Higbee Beach [photo by Mike Crewe]. And, of course, with a good songbird flight come the Sharp-shinned Hawks - time to head over to the Hawkwatch Platform [photo by Mike Crewe]. And so came the warblers. From Higbee Beach in the morning, via Cape May Point State Park midday to Lake Lily in the evening, the warblers were here to be found today. Though birds were scattered throughout the area, certain favored localities concentrated the birds - all the warbler shots here were taken at CMBO's Northwood Center this evening, starting with this perky Magnolia Warbler [photo by Mike Crewe]. Furtively hunting through the Virginia Junipers (OK, Eastern Red Cedar if you prefer!) this Black-throated Green Warbler was a nice highlight with its startlingly yellow face [photo by Mike Crewe]. 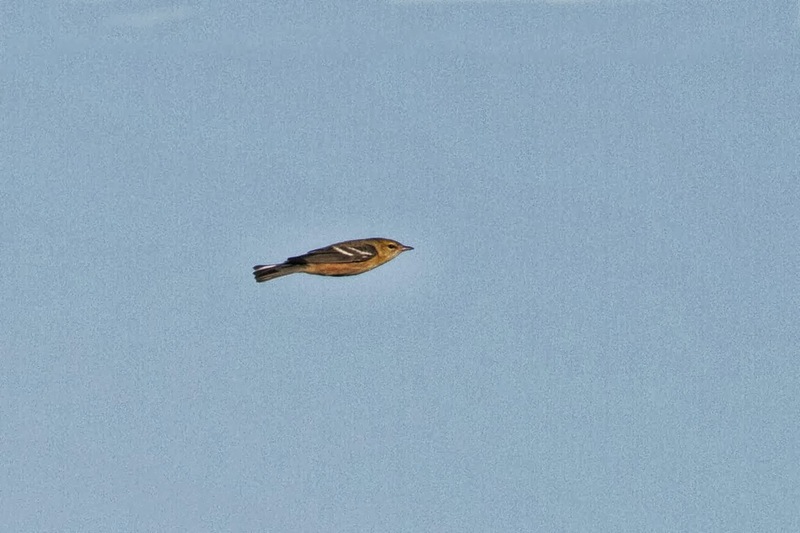 With so many Cape May Warblers on the Morning Flight, it was only a matter of time before they turned up elsewhere. Cape Mays like conifers so checking the junipers is always a good move [photo By Mike Crewe]. Not the best picture of the day, but Bay-breasted Warbler is always a much-sought bird at Cape May, with a fondness for lurking in the shadows and never quite showing itself properly. Keep an eye out for an unstreaked warbler with two wingbars and a pinkish wash to the sides [photo by Mike Crewe]. No, honestly, this picture really is the right way up! Black-and-white Warblers are nothing if not entertaining as they work their way around craggy tree trunks looking for food like little stripy nuthatches [photo by Mike Crewe]. It wasn't just warblers that were on the move today; Blue-gray Gnatcatchers put on a good show and at least six were working through the trees at the Northwood Center toward the end of the day [photo by Mike Crewe]. Also moving today were Red-eyed Vireos - this one posed perfectly on the powerline at the Northwood Center today [photo by Mike Crewe]. Watching you, watching me. With so many songbirds in town, you can bet that you won't be the only one watching what's going on in the trees around Cape May Point. Good numbers of Merlins are in town right now and late afternoon and evening are the perfect time to see them out and about and looking for a late meal [photo by Mike Crewe]. The period began with the passage of a cold front 14 Sep, which produced decent hawk and songbird flights. A second, weaker cold front cleared Cape May 16 Sep, and was followed by strong easterly winds 17 Sep. High pressure took hold for the rest of the period, with above-average temperatures and southerly winds. Notable birds during the past week included Brown Booby and Lark Sparrow. Two Brant were observed in the back bays 15 Sep (DL et al. ), potentially the same pair that spent the summer in the area. A rather unfortunate high count involved 34 Mute Swans on Bunker Pond 15 Sep (TR). 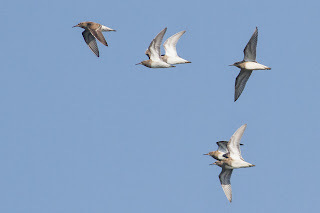 The season's first Northern Pintails came by way of a southbound flock of nine over Cape May Point 14 Sep (TR). Interesting was a Northern Bobwhite seen near Davey's Lake 14 Sep (EO). A southbound Common Loon was observed from Cape May Point 20 Sep (TR). Birders who chartered a fishing boat out of Cape May 19 Sep reported a juvenile Brown Booby less than 15 miles offshore Cape May (BE et al.). Northern Gannets are being seen from Cape May Point almost daily, and small flocks of Double-crested Cormorants are now on the move every day. An American Bittern put on a great show at Bunker Pond 16 Sep (m. ob.). A noticeable nighttime movement of Great Blue Herons occurred 17 Sep, while at least three Little Blue Herons continue to show nicely at Cape May Point State Park. Raptor flights have been rather light. Selected daily maxima for the period included 36 Bald Eagles, 152 Ospreys, and 201 American Kestrels on 14 Sep, and 179 Sharp-shinned Hawks on 20 Sep (TR). At least one Sora has been reported from the SCMM in recent days. 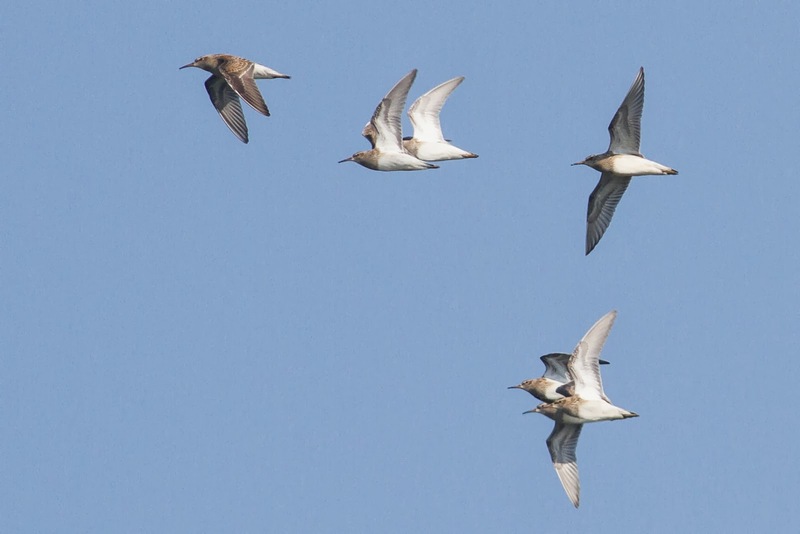 Strong northeast winds likely helped bring five Hudsonian Godwits over the CMHW 17 Sep (TM, m. ob.). Two Marbled Godwits were viewed in the back bays from The Osprey tour boat 16 Sep (fide VE). The season's first Buff-breasted Sandpiper finally flew past the CMHW 19 Sep (TR), and a Baird's Sandpiper flew past the CMHW 16 Sep (TR). Lesser Black-backed Gulls have been easy to find along the CMPSP and SCMM beachfront, with eight present 16 Sep (TR, EM). Multiple Parasitic Jaegers can be seen in "the rips" from Cape May Point on a daily basis. There have been no reports of the juvenile Long-tailed Jaeger since 13 Sep. At least two Eurasian Collared-Doves remain at Cape May Point. Black-billed Cuckoo reports have been few, so it's worth noting one present at the CMHW 17 Sep (TM). Two Red-bellied Woodpeckers and a Hairy Woodpecker that flew past the CMHW 19 Sep were likely migrants (TR). Single Olive-sided Flycatchers were found at the Beanery (RH, KH, et al. ), Higbee Beach (m. ob. ), and Reed's Beach (KK, DR) 14 Sep. Philadelphia Vireos have been rather scarce this year, with only a handful of recent reports. Noticeable swallow movements occurred on multiple days during the past week. Small numbers of lingering Purple Martins could still be found throughout the period, and 40+ Cliff Swallows were over Cape May Point 19 Sep. The season's first Ruby-crowned Kinglets descended upon Cape Island 14 Sep (m. ob.). Observers who have spent time listening for nocturnal migrants were rewarded with the season's first Gray-cheeked Thrushes calling over multiple locations 15 Sep (MO'b, DF, TR). Warbler numbers during the period were unremarkable. A post-frontal movement on 14 Sep was headlined by three Connecticut Warblers and a late Cerulean Warbler at the Higbee Dike (GD, SG). Reports of birds on the ground have been sparse, though a Kentucky Warbler was reported at Higbee 20 Sep and small, mixed species feeding flocks can be found around Lily Lake some days. News from the sparrow department is still quiet, though that should soon change. 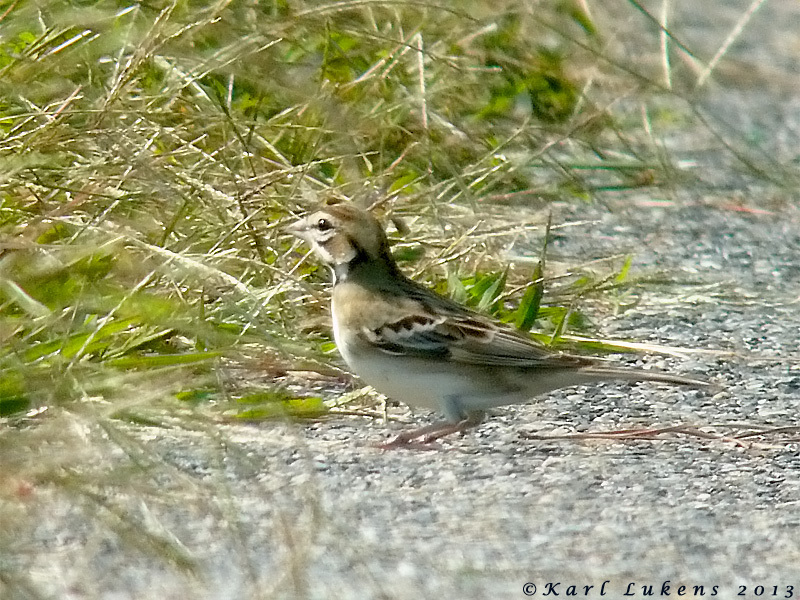 A Lark Sparrow was found near Davey's Lake 14 Sep (EO). Observers/contributors: Mike Crewe, Glen Davis, Bill Elrick, Vince Elia, Don Freiday, Sam Galick, Kathy Horn, Roger Horn, Kevin Karlson, David Lord, Tom Magarian, Emily Martin, Evan Obercian, Michael O'Brien, Tom Reed, Dale Rosselet. Though a run of unfavorable winds - ranging from north-east to south-east - seems set to continue to plague us for a few more days, there is, nevertheless, a nice scattering of birds around Cape May Point at the moment. The trees around the Northwood Center and the eastern side of Lake Lily have consistently provided good birding opportunities over the past few days, with a dozen or so warbler species being noted - including two Bay-breasted Warblers that hung out together for quite some time. Not too far away, off Stevens Street, banders reported Hooded, Mourning and Canada Warblers, Yellow-bellied Flycatcher and Ruby-crowned Kinglet in a single yard. Over the past week or so, a nice run of good birds has shown up and provide a good, solid opener to the main event still to come. Highlights and birds of interest of recent days have included Parasitic Jaeger, Northern Gannet and four Brown Pelicans off Avalon on 8th, Yellow-headed Blackbird at Bunker Pond on 9th, Lark Sparrow at Higbee Dike and Clay-colored Sparrow at Brigantine on 9th, four Baird's Sandpipers reported briefly at The Meadows and a Sora there on 13th, Olive-sided Flycatcher at the Rea Farm and Lark Sparrow at Davey's Lake on 14th, Red-headed Woodpecker at Cape May Point on 15th, a showy American Bittern and a fly-by group of five Hudsonian Godwits seen from the Hawkwatch Platform on 17th. The Long-tailed Jaeger seems last to have been seen on 13th. Not sure what to make of the weather over the next couple of days, but this time of year always produces good birding at Cape May - and sometimes the 'wrong' weather brings re-orienting strays to the point. 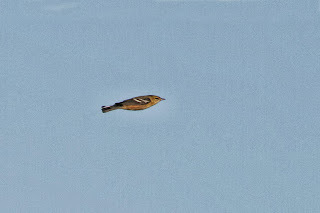 Tom Reed predicted a Northern Wheatear at the point today. Maybe it was here, just not found, but there's plenty of places to go looking. This morning's state park walk saw plenty of birds breeze in and out of our field of view, from two Least Flycatchers and a Cape May Warbler at the parking lot to a noisy group of two adult and two juvenile Caspian Terns passing low overhead. At least four Lesser Black-backed Gulls were on the south beach and a good mix of herons and egrets continue to pass through the area. Keep an eye out anywhere around Cape May Point for warblers over the next couple of weeks. This agile Chestnut-sided Warbler was leaf-gleaning around Dwarf Hackberries on East Lake Drive this evening [photo by Mike Crewe]. Higbee Dike - as promised! Well thankfully, as predicted, birds descended on Cape May today and, given the prevailing conditions, it is no surprise that Higbee Dike was the place to be at first light this morning. Though there wasn't a big flight today it was, nevertheless, well worth being there, as pockets of mixed warblers swept past at knee height, interspersed with a good showing of Baltimore Orioles, Scarlet Tanagers, Blue-gray Gnatcatchers and Rose-breasted Grosbeaks. Ruby-crowned Kinglet, Dickcissel and Red-headed Woodpecker added to the variety, while commonest species included Bobolink, Cedar Waxwing, American Redstart and Blackpoll Warbler, as well as a good showing of Black-throated Blue Warblers. Glen Davis's full 'official' count for Morning Flight will be posted on our Seasonal Research page. In contrast to the dike, the fields were pretty quiet by all accounts, although a quick look after I left the dike revealed two Cape May Warblers and three Veeries at the north end of the main trail. An Olive-sided Flycatcher was the highlight of our Beanery walk this morning, with a smattering of warblers, two Yellow-billed Cuckoos and other migrants making for a fun walk. I haven't heard the final score from the Hawkwatch yet today, but when I stopped by there before lunch there was a nice movement of birds shaping up - my brief visit produced three Bald Eagles, Peregrine, Broad-winged and Red-tailed Hawks, male Northern Harrier and a run of American Kestrels. Finally, if you are in town, it's worth staying out a little later of an evening now and checking ponds at The Meadows; both Sora and Common Nighthawk were there last night, so I reckon there will be a few pairs of eyes scanning this evening. This morning's American Redstart flight was early enough in the season to include a high percentage of colorful adult males [photo by Mike Crewe]. Even in flight, that white 'pocket handkerchief' helps to make a Black-throated Blue Warbler readily identifiable [photo by Mike Crewe]. A small run of Scarlet Tanagers accompanied the warbler flight at Higbee Dike this morning [photo by Mike Crewe]. A heavy head, chunky bill and a lot of white in the wing are good pointers toward an adult male Rose-breasted Grosbeak [photo by Mike Crewe]. In complete contrast to a grosbeak - small-headed, small-billed and without wingbars all add up to Blue-gray Gnatcatcher [photo by Mike Crewe]. And finally, 'the one that got away, subsection photograph' category. I could pretend that I used a slow shutter speed deliberately to create the feeling of movement here, but really, I messed up by having the camera on the wrong setting! I was photographing the Merlin on the right as it headed straight toward the Hawkwatch Platform when the crazy guy on the left came hammering in and made a fool of himself! As we've said before, Merlins really can't pass anything moving without giving it a good seeing too... [photo by Mike Crewe]. Those who know me, know that I am very cautious when it comes to making predictions of good birding days at Cape May, but tomorrow is shaping up to produce something interesting. With winds turning to north-westerly last night, there was some hope that we would have a fallout this morning, but that idea was knocked on the head by the thunderstorm that passed to the north of us, cutting off any flow of birds that might have been heading our way. Perhaps as a result, our Higbee Beach walk this morning was pretty quiet for songbirds, but we nevertheless still saw a nice range of bird species. A good flight of Royal Terns was taking place, with birds moving north on a localized feeding mission - a couple of Caspian Terns put in an appearance too, one of which made a half-hearted mobbing attempt at an adult Bald Eagle that was cruising right over our heads at the time. A quick check at the Hawkwatch Platform at lunch revealed a good falcon flight shaping up - if you're in town, I suggest getting down there this afternoon as the American Kestrel and Merlin flight that is currently taking place may well continue this afternoon. Mike Newlon recently sent me a fine trio of hairstreak photos that he shot at Higbee Beach recently, and which I felt were well worthy of a wider audience. 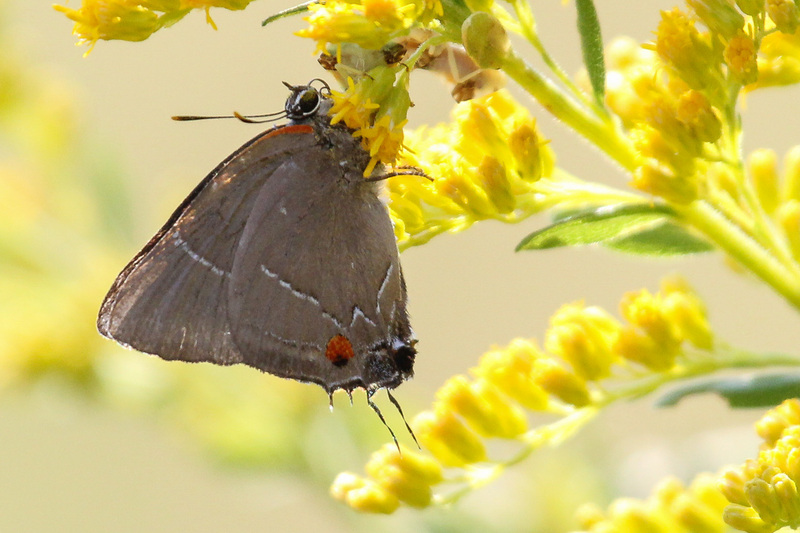 Hairstreaks are small and perhaps easily overlooked, but keep an eye out for them around Cape May Point during the fall. Gray Hairstreak (above) is the most likely species you may encounter during September or early October and is the only one of our hairstreaks that will habitually sit with its wings open. 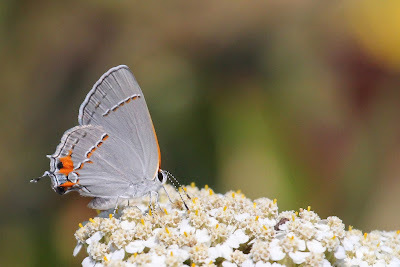 Least common of the trio here is White M Hairstreak. 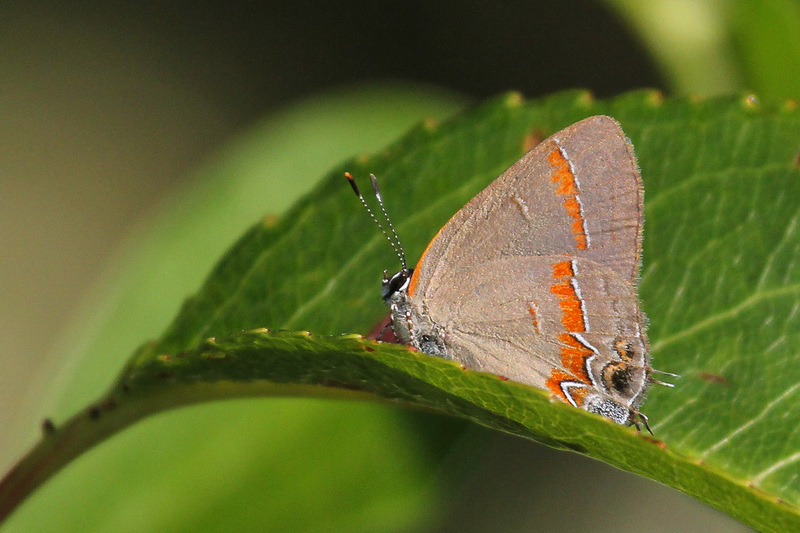 Compared with Gray Hairstreak, it has less red at the back edge of the hindwing, a dotted white line that forms a more obvious 'M' or 'W' mark (depending on which way up it is!) and it has a small, isolated white spot near the leading edge of the hindwing [photo by Mike Newlon]. Lark Sparrows seem increasingly more regular through Cape May each fall - this one spent a few days at Cox Hall Creek WMA recently. Though this bird now seems to have moved on, there may well be more - the path behind the dune line at Cape May Point State Park is a good place to look [photo by Karl Lukens]. September is peak time for Lesser Black-backed Gulls at Cape May Point - check for them down on the tideline along the South Cape May beach. Highest count I have heard of over the past week is 12, with a good range of different ages represented. 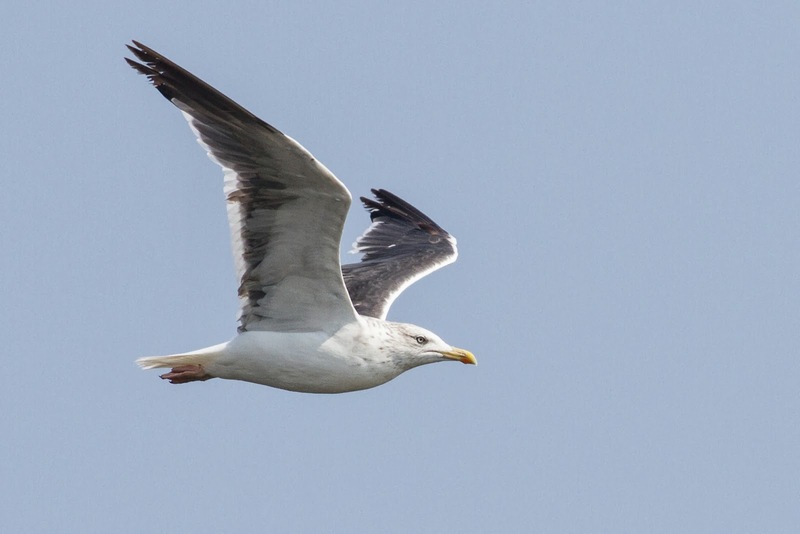 Once they have their slate-gray backs, that alone will distinguish them from other gulls in the area. For young birds like this one, look for a bird the size of an American Herring Gull but with plumage more like a Great Black-backed Gull; ie with a much paler head than a young American Herring Gull. 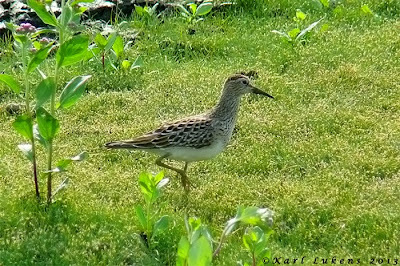 Young birds like this have pink, not yellow legs [photo by Mike Crewe]. The Cape May Hawk Banding Demonstrations will be starting this weekend, Saturday September 21st and will continue to the end of October. Demonstrations take place by the Hawkwatch Platform on Saturdays and Sundays at 10:00am. This young Bald Eagle was caught by the banders this week, marking a fine start to the season for them [photo by Mike Crewe]. And talking of the Hawkwatch Platform, don't forget to stop and say hi to our wonderful interpretive naturalists stationed there this season. As you can see here, my visit there today revealed that they are really pushing the boat out to ensure that the very best identification skills are shared on our recent sightings board!!! Long-tailed Jaeger and other Cape May Craziness! !